Even a smaller project can make a big impact. Our Durham division recently completed a 50 square yard asphalt patch repair at the First Presbyterian Church in Raleigh that proved to be a feather in our cap. 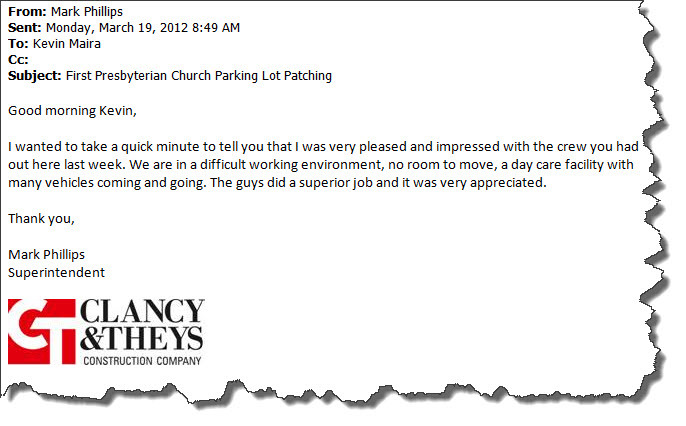 Clancy & Theys was the general contractor for a larger renovation going on at the church and contracted us to complete the repair. Mark Phillips, superintendent for Clancy & Theys, was impressed with our work and sent Kevin Maira, Ruston Paving’s project manager, a nice email complementing our crew. Thanks Mark!